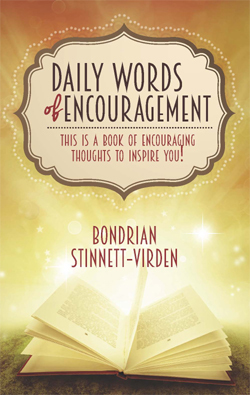 Daily Words of Encouragement contains a select collection of motivational thoughts that will inspire you to think beyond your daily challenges. Each devotion is a quick note to shine some light along the darken paths we travel in life. These inspirational writings are reference points to build on, and a witnessing tool to share in your daily conversation with others. In this book you will be assured that God knows depths of your heart and the intensity of your struggles. He knows we all need H.E.L.P: healing, encouragement, love and peace. This book was written with you in mind, knowing all about the trials and tribulations that everyone experiences. You will be surprised to know how a simple word may brighten your day. Daily Words of Encouragement will put a smile on your face and lighten the load to give you the strength you need to experience a victorious day. This is not daily journal or a typical book with chapters, but collection of simple thoughts and scriptures to remind you that even when confronted with life’s challenge, the end is not yet. Therefore, be encouraged, and in times of darkness and despair, don’t give up—simply, turn on some lights! Copyright © 2010 Life To Legacy,LLC All rights reserved.